I had a reader get in touch wondering if she should be worried about Coca-Cola’s (NYSE: KO) balance sheet. Like many stodgy blue chips the company has issued a fair slug of debt over the past few years. For instance at the end of 2012 Coke had around $32 billion worth of debt sitting on its balance sheet. Right now it has more like $50 billion worth of total debt outstanding. Even after netting out cash and short term investment we are looking at $26 billion worth of net debt here (and a $10 billion increase on 2012’s comparable figure). No doubt this increase is the source of the reader’s concern; perhaps doubly so since headline net profit has not really increased over the same period. That said the situation with Coca-Cola is actually quite interesting and merits a closer look. To see what I mean by that just check out the company’s annual interest bill. Now you’d probably expect it to have issued all that debt at pretty low interest rates. Let’s use 3% as a ballpark figure. On total net debt of $27 billion (as it was at the end of FY 2017) you might therefore have expected the annual interest bill to hit somewhere around the $800 million mark. In reality Coca-Cola paid just $164 million in annual interest during its fiscal year 2017. Even with the very low interest rate environment we’ve been through over the past decade it seems strange that Coca-Cola’s effect interest rate amounted to just 0.6%. Of course there isn’t any great mystery here. Most stock tools and screeners (e.g. YCharts, Stockopedia) define net debt as total debt minus the sum of cash and short-term investments. (The latter are usually bonds that will a mature back into cash within a year). In Coca-Cola’s case we can see that at the end of Q3 2018 it had around $9 billion worth of cash and a further $9.75 billion in shorter term investments. This stacked up against a total debt pile of just under $45 billion. Subtracting the sum of the former items from the latter gives us the $27 billion net debt figure quoted above. In many cases that is all you need know. 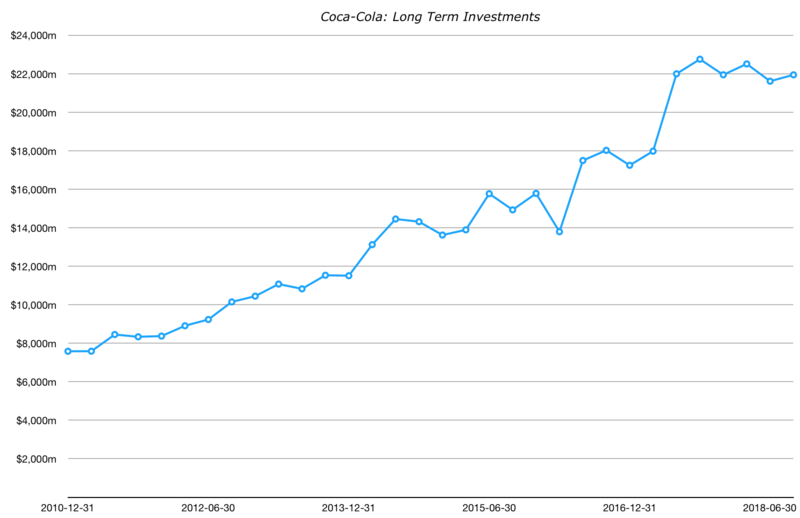 Coca-Cola, however, has historically invested its surplus cash into longer term investments as well. At the end of Q3 2018 the value of these long-term investments amounted to almost $22 billion; a figure which brings the total value of its investment pile to over $30 billion (rising to $40 billion once you add in cash). These investments provided interest income of over $675 million in 2017, which helps explain why Coke’s net interest expense was so tiny. 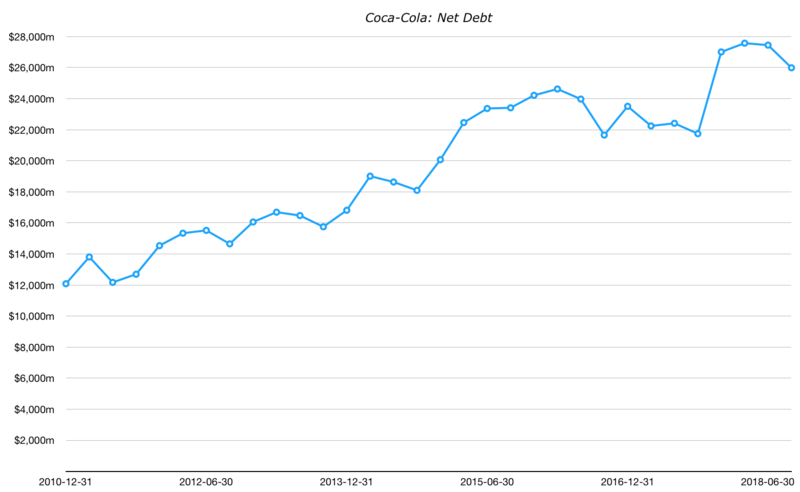 In fact before 2015 Coca-Cola’s net interest expense was actually negative. In other words it generated more interest from its investment pile than it paid to service its own debt. For instance in fiscal year 2014 net interest income totaled around $110 million. At the same time “net debt” stood at just over $20 billion. An entity apparently being paid to issue debt would look strange if you only ever looked at the headline stock screener figures (unless you happen to be Switzerland I guess). In any case that hopefully helps to explain why Coke’s balance sheet is fine. Having investments and cash worth $40 billion against total debt of $44 billion suddenly looks a lot more conservative than it did before!